This page provides access to a select variety of material relating to evaluation of EMR health risks, corroborative science and reduction of personal exposure through informed management of one’s energetic environment. Additional content will be added in due course, or by request from readers. 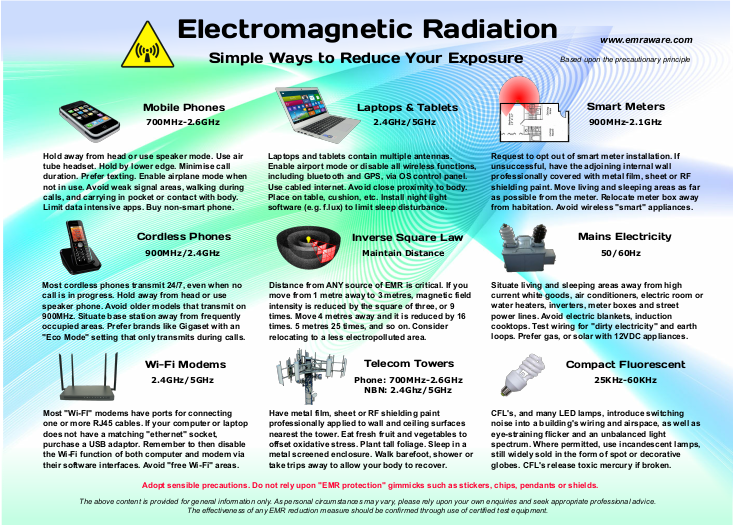 For hundreds more, search YouTube or BitChute for “EMF health effects”. The following websites can help you steer clear of ambient radiation from phone and NBN towers. Two year old Poplar trees. Leafy trees, when densely planted in parallel rows, can partially absorb radiation from phone towers and other microwave sources. 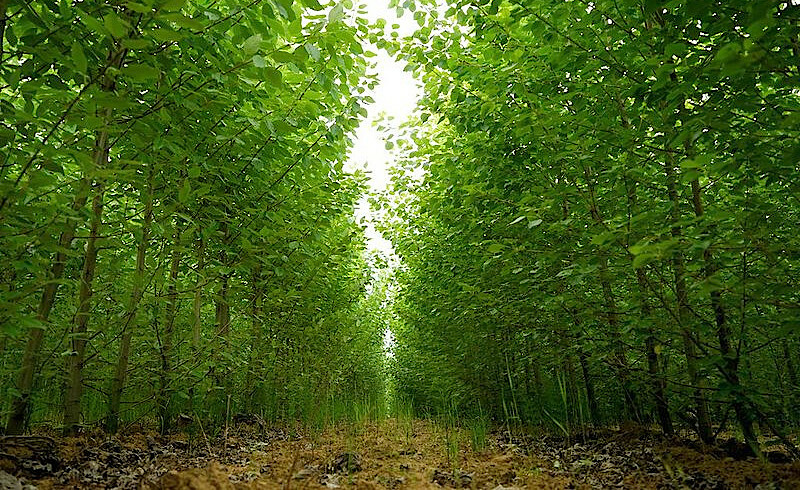 Fast growing varieties, 6 to 15 feet per year, include Willow and Poplar hybrids as developed for timber plantations. Note that in some climate zones they may shed leaves in Winter. Blue light from tech viewing screens inhibits Melatonin, a hormone vital to sleep and EMR-combating immune function. The program f.lux, among others, will automatically shift the chromatic balance toward the warmer part of the spectrum after dark. Due to widespread electro-pollution, the tonifying spectrum of frequencies natural to our planet have become obscured to the human body. One way to reintroduce them is through a pre-recording of their detected activity. This can be played from an MP3 player into the voice coils of a set of large headphones, placed nearby to induce mild field effects. Click here to download a 12 minute WAV file (11MB) of Schumann Earth-ionosphere resonance activity recorded at a university geophysical station. Select loop mode for continuous output. Alternatively, activate the button below to play directly from your computer. The value of a good quality EMR meter cannot be overstated, particularly when seeking to confirm the effectiveness of precautionary measures taken. For mains appliances and wiring only, the first two below are about $30-60 USD respectively from major online retailers. To include the far higher frequencies emitted by mobile phones and other wireless technologies, it is necessary to spend more. The TriField TF2 or Cornet ED-88T are popular and cost-effective choices beginning at around $170. Finally, here is a free option, suitable only for informal demonstrations. 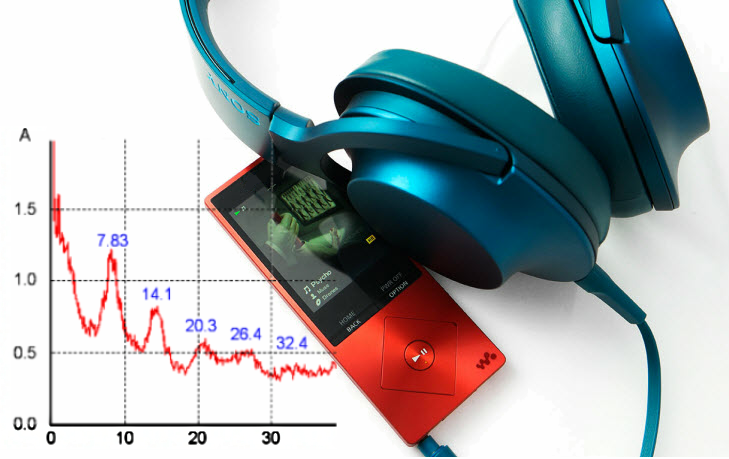 Using an AM Radio to Detect EMI (YouTube video). Barrister Raymond Broomhall speaking on camera to the Australian association ECSFR about options for legal action against telecommunication towers. We are presently compiling a register of medical doctors, legal professionals and Government authorities within Australia who have proven to be supportive of electro-sensitivity initiatives. If you are aware of any, please forward their particulars via our contact form. This information will not be published, but instead provided to interested persons upon request. Established biomarkers of electro-sensitivity include high levels of blood histamine, elevated NTT (an oxidative stress marker), and presence of S100B (a marker of blood-brain barrier leakage). © Copyright 2019 by EMR Sanctuary. All rights reserved.